Skyworks’s SKY12207-306LF is a Single-Pole, Double-Throw (SPDR) silicon PIN diode switch capable of handling high power. This switch operates over the 900 MHz to 4 GHz band and features low insertion loss, excellent power handling, and superb linearity with low DC power consumption. The SPDT switch is well suited for use as a high power transmit/receive switch in a variety of telecommunications systems such as WiMAX, TD-SCDMA, or LTE base stations. 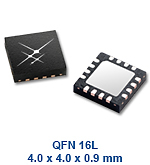 The device is provided in a 4 x 4 mm, 16-pin Quad Flat No-Lead (QFN) package.